Set in the Post-Voyager era (mid-silver age). 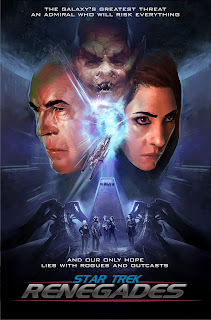 We are very pleased to announce that Star Trek: Renegades will be producing further episodes! As promised to our backers, we engaged the top entertainment attorney in LA who has exceptional connections to CBS and Paramount. For reasons we are not able to disclose, CBS cannot move forward with Star Trek Renegades at this time - or any Star Trek series for that matter. We have nothing but praise for CBS. Their approach in allowing these independent productions supported by fans is enlightened and progressive. They deserve kudos for understanding that it is us -- the fans -- that keep Star Trek alive. So, we are excited and pleased to announce that we will be moving forward with Renegades as an independently produced fan-supported Internet TV Series! Our current film will be denoted as Episode 1 (the pilot) and we are actively writing Episodes 2 and 3. Walter Koenig has agreed to reprise Admiral Chekov in this two-part episode, with Episode 2 ending with a cliffhanger, and Walter has decided that Episode 3 will be his final performance as Chekov. We are so honored to work with Walter, who will be an active participant in the writing and production. In addition to most of our returning cast, we also plan to bring in many fellow Trek stars and their familiar characters to join us. As we complete the final fulfillment of all our rewards, we will be announcing a new crowdfunding drive for the next two episodes. Beyond that, however, we have an innovative new plan for funding subsequent episodes. Our goal is to produce 12 episodes a year, or roughly one per month! To accomplish this, we’ll use conventional episodic television production schedules, including shooting each episode in 7-8 days, editing and scoring the episode over the next month, then completing the VFX over the following 2-3 months. And this is now possible since we have the core Renegades team in place, and most of the difficult and time-consuming VFX work was accomplished for the pilot. We hope you enjoyed Renegades and will continue to support our Series. We have multiple story arcs in the works which will extend over multiple episodes and even seasons! Post Fan Film Guidelines, they decided to be a non-Trek series. why has this fan film been removed from you tube as violation of you tube policy? I bookmarked this a few days ago to watch when I had more time, now it is removed from you tube as violation of you tube policy against spam, scams, and deceptive content. As an interested fan I am very disappointed, and have to question the credibility of kickstarter projects. Renegades Episode 1 is back up.